Audioslides are 5-minute long presentations illustrating the main points of scientific papers in an accessible way. As an author you’re allowed to use 5-8 images as illustrations, and just your voice, no video. So, they’re pretty boring, but to the average reader perhaps less boring than actually trudging through a scientific paper to get to the good bits. 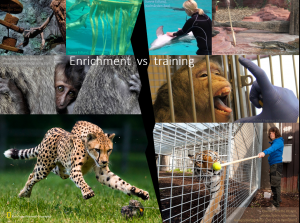 In this paper published in 2014, I discussed the extent to which welfare effects of training and enrichment overlap. I often find that people prioritize enrichment over training and would discourage that bias. Click the image and see the Audioslide, and find the paper here!